Look up EMS training and you’ll find it hailed by one lean and lithe celebrity after the other, including Heidi Klum, Elizabeth Hurley, and Madonna. But can you really replace your five-times-a-week, hour-long gym sessions with just 20 minutes of electronic muscle stimulation and simple resistance movements? As it turns out – depending on what you want to achieve, of course – you may be able to do just that. 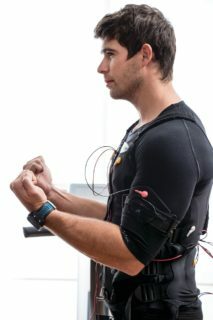 I was excited to test out BODYTEC’s EMS training for a couple of weeks and find out for myself what benefits it held for my fitness regime. What is Electro Muscle Stimulation (EMS)? The technology involved causes 90% of your muscles to be activated through electric impulses. When your muscles then practice traditional, low-impact exercises, your muscles contract at a much higher intensity. The result is an intense, full-body workout, the effects of which you will feel as intensely within 48 hours of the session – irrespective of your fitness level. At the Rosebank studio in Johannesburg, I poured myself into a skin-tight black Lycra suit – with absolutely no underwear allowed – that would be spritzed with water. I was then strapped into the electrode jacket, with its belts strapped around my arms, waist, lower back, thighs and buttocks, whereafter the jacket was connected to the electrodes. These are directly above the muscle, and my instructor would direct me to do simple, functional movements such as lunges, squats, twists and bicep curls. Not half, it isn’t. First off, the feeling of the pulses crawling through your muscles is very strange, almost like a vibration under your skin. Imagine having to lift your arm above your head, but a powerful force if holding you back. Repeat the exercise with different movements for 20 minutes, and you’re out of breath and sweating. In addition, each session would be harder than the previous one, and as the intensity is picked up each week, it can get pretty painful. This is to ensure that your muscles get stronger with each session and to encourage progress. Understand me when I say the stiffness afterward is extreme. I’ve done both the Cape Town Cycle Tour and the 94.7 Cycle Challenge, along with my fair share of week-long hiking trips, and I enjoy an active lifestyle overall. Nothing, however, can compare to Day 2 after one of these sessions. On the other hand, I would say it’s definitely worth it. The science behind the EMS methodology is sound, and it is an especially effective way to fit the effects of longer, conventional weight-training sessions into an intense but meager 20 minutes. As such, it is a good solution for those who need to budget every hour of their day. It’s also suitable for anyone between the ages of 16 (with parental consent) and 85 because there is a decreased risk of injury since is it a weight-free, strength workout that doesn’t put pressure on your joints. If you are training for an event and you’re looking to tone up and build muscle, EMS training will be a good addition to your weekly fitness regime. As a result of vast differences in our genetics, what works well for one person’s fitness will not do as well for another. Our genes influence the various aspects of fitness, from whether we are better at performance training than resistance training, or vice versa, to whether we train better in the morning or the evening, and how quickly we recover from hard physical exercise. In order to better understand how to personalize my fitness regime, I enlisted the help of JOINCIRCLES and DNAnalysis, which provided me with the opportunity to try out their DNA Sport test. Click on the link to find out how your fitness regime and your DNA are linked – and how you can develop the optimal regime based on what you have been genetically endowed with.